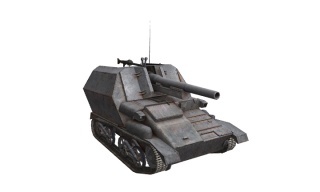 In 1940, German forces captured several light British Mk. VI tanks. 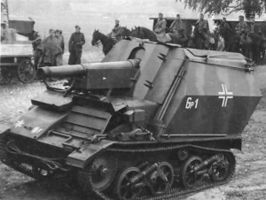 The vehicles were redesignated as Leichter Panzerkampfwagen Mk. IV 734(e) and used for training purposes by the Wehrmacht until the fall of 1942. 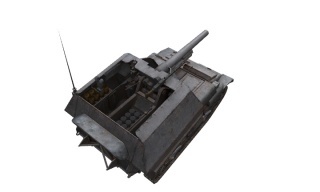 In November, the decision was made to develop a self-propelled gun on the basis of the captured vehicles. In 1942, modifications with a 105 and 150 mm field howitzer were developed. All these SPGs were lost during the defense of France in the summer and fall of 1944. 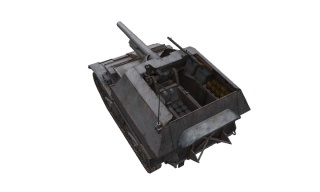 A decent Tier 2 SPG. Note that the long range of the gun is somewhat hampered by a short-range radio. This can lead to games where allies advance out of radio range, leaving you with no targeting information. The 105mm howitzer, while being a rather large gun for the second tier, even on artillery, pays for its range and damage with a reload time that can be defined as abysmal. 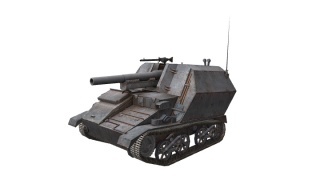 Next, research the G.Pz. Mk. VI (e) Suspension. Earlier it was believed that these SPG's were never actively used and spent their "life" in Belgium as training vehicles. However, now it seems they were transferred to the Artillerieregiment 227, fighting near Leningrad in late 1941, where they apparently survived until 1942. 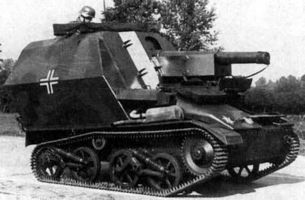 The full German name of this vehicle is "10,5cm Selbstfahrlafette auf Geschützpanzer Mk.VI(englisch)". This page was last modified on 19 July 2018, at 17:46. This page has been accessed 60,711 times.